iPhone SLR Mount enables iPhone to use DSLR lens which is basically a case for iPhone to adapt the Lens of DSLR cameras from Canon or Nikon. The massive case is made of aluminum. It has two loops for attaching a strap and a standard location for mounting on a tripod. Obviously, the focus must be done manually on the lens. Apparently, iPhone SLR Mount is manufactured by 2-3 brands, most pronounced are Photojojo with the name iPhone SLR Mount and priced at $250 (one dollar less in real) and SLR Jacket by TurtleBack which is a bit less costly. The thing is nothing but a mechanical arrangement to mount the lens so that the optical axis of DSLR Lens remains in the same line that of iPhone’s main camera. In other words, it might sound very very promising, but from practical aspect, iPhone becomes dependent on the size of the Lens! MacLife reviewed TurtleBack’s one, gave a score of 2/5 and we this time used Photojojo’s one, which probably optically fits in a better way – simply if you notice the photos you will understand, it is not the Lens but the sensor, imaging engine making the ‘hardware’ a bit less effective. 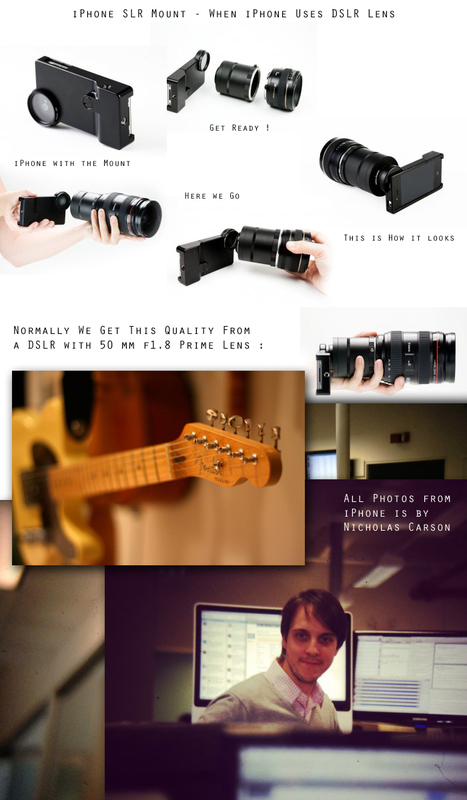 Photojojo should be rated 3/5 for their iPhone SLR Mount. Probably the apparently not understandable position of the iPhone camera or may be the iPhone tag makes it too costly – $250 honestly is too much to use the iPhone Sensor. You practically only can reduce the bulk of DSLR camera body, if you want to use it seriously. The result with Photojojo’s iPhone SLR Mount is definitely far above what normal iPhone can do, simply because of the optical effects exerted by the lens. But it is the iPhone’s sensor size – that is crop factor plus other technical things make the investment, from our point of view – costly. Our view is from a typical DSLR user, obviously if you do not have a DSLR but want to combine with Canon’s 50 mm prime Lens (Nifty Fifty) – the total cost becomes around $350. He wrote it quite seriously – with Pros, Cons and with demonstration of all possible way of usage ! This Article Has Been Shared 9416 Times! How to Shoot Action and Sports with Digital Camera which is field quite difficult field to master and demands high-end equipment for high quality images. Cite this article as: Abhishek Ghosh, "iPhone SLR Mount : When iPhone Uses DSLR Lens," in The Customize Windows, September 3, 2013, April 18, 2019, https://thecustomizewindows.com/2013/09/iphone-slr-mount-when-iphone-uses-dslr-lens/.